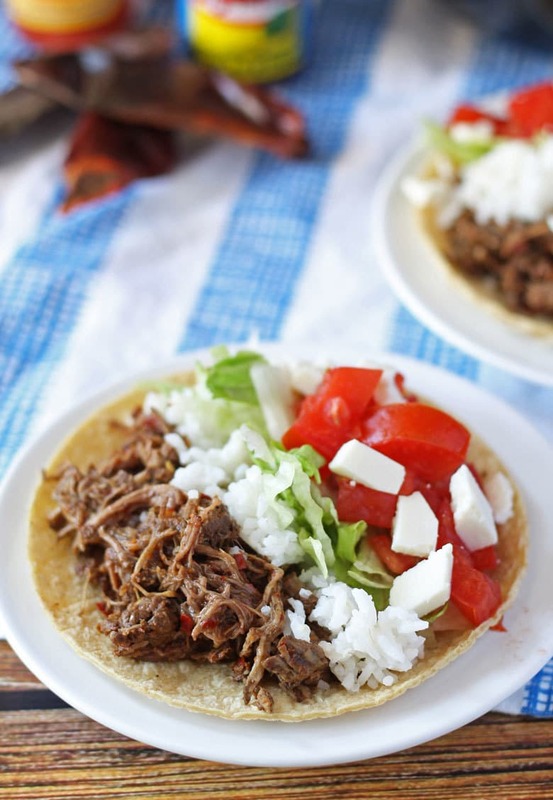 Make this slow cooker barbacoa beef the next time you are in the mood for tacos, burritos or quesadillas! Mr. B and I have been a couple for almost 6 years. Every year, winter after winter, he was outside in the snow, grilling. Then Polar Vortex 2013/14 happened and he stopped. This year has so far proven no different – we haven’t had too much snow yet but the cold has stopped him from uncovering the grill. I am starting to miss our favorite tacos a lot. The first thing is order a George Foreman grill off of Amazon. I remember when I was living in the college dorms how crazy popular they were. I think they were against the dorm rules – being the rule following person that I am, I didn’t get one then. I kind of forgot about them post-college and then out of nowhere the other day, Mr. B asked me my thoughts on them. So I bought one. Ha, very impulsive of me but I really want those tacos. The second thing I did was come up with a new meat recipe so I can have some tacos while I wait for my indoor grill to arrive. 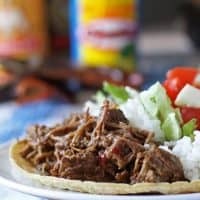 The slow cooker coffee barbacoa beef recipe I came up with is based off of a copycat Chipotle recipe. 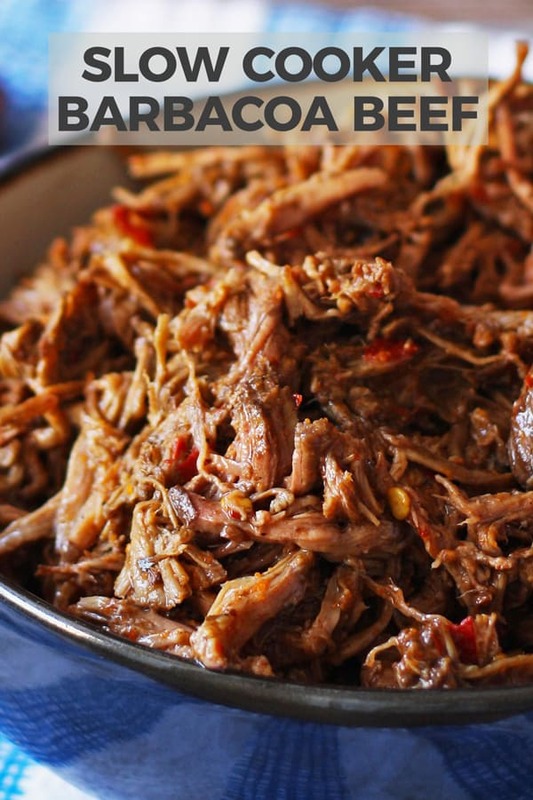 I really wanted to make something similar to the Chipotle barbacoa beef, but I realized I had no idea what barbacoa was. I had to do some serious research – the name sounds like BBQ and we thought maybe it was some kind of spicy pulled BBQ beef. Wrong wrong wrong. It is really just a slow, low-temp cooked meat that pulls apart very easily. And it is delicious. Traditionally it is made from sheep, lamb or goat – I have no plans to cook any of those animals in the near future so I went with beef instead. The coffee is used more to tenderize the meat than to flavor it. If you are looking for a strong coffee flavor, substitute some of the broth for more coffee. Personally, I would substitute in 1/4 cup amounts, but that’s just me. 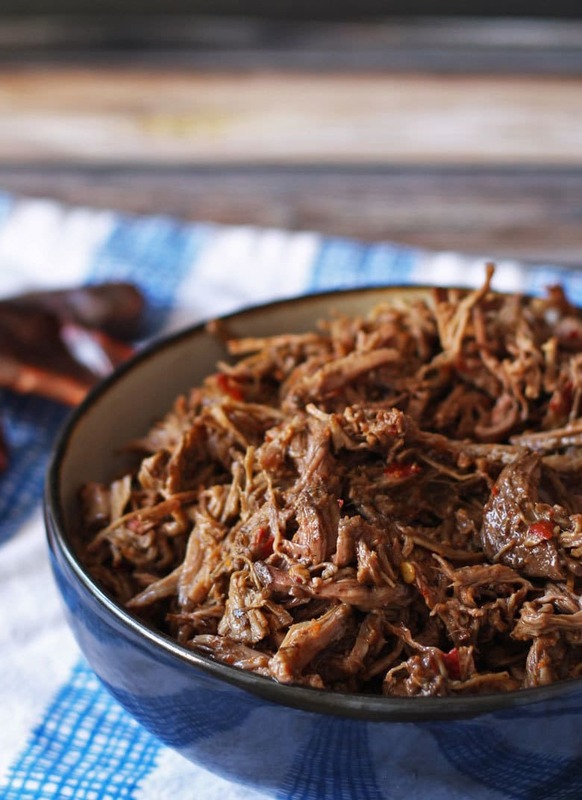 After you’ve finished cooking, you’ll be left with 4 pounds of tender meat, ready for tacos, burritos, quesadillas and more. It is juicy and full of flavor. In fact, it is so good that one of Mr. B.’s coworkers stole half of one of the containers he brought to work. Nothing says “this one is a winner!” like someone stealing it. I was equally honored and p-ed off. 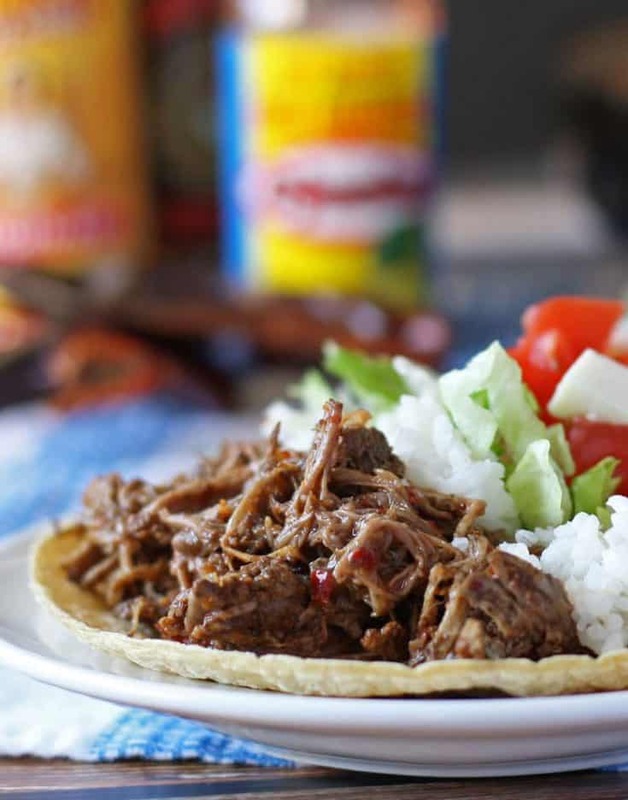 Make this slow cooker barbacoa beef the next time you are in the mood for tacos, burritos or quesadillas! If you're looking for game day recipes, this is the perfect dinner! Cut the roast into 8 equal-sized pieces. Sprinkle the salt evenly on the meat pieces. Heat the oil in a skillet over medium-high heat. Brown the meat on all sides, then place in the bottom of a large slow cooker. In a food processor, chop the garlic and chiles for 1 minutes on low. Then add the oregano, black pepper, chicken broth, coffee, and lime juice and pulse until combined. Pour over the meat - the top portion of the meat should not be under liquid. Cook on low for 6 hours. 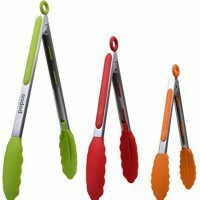 When finished cooking, use 2 forks or tongs to pull the beef apart. Then stir well so that all meat is mixed in with the liquid. 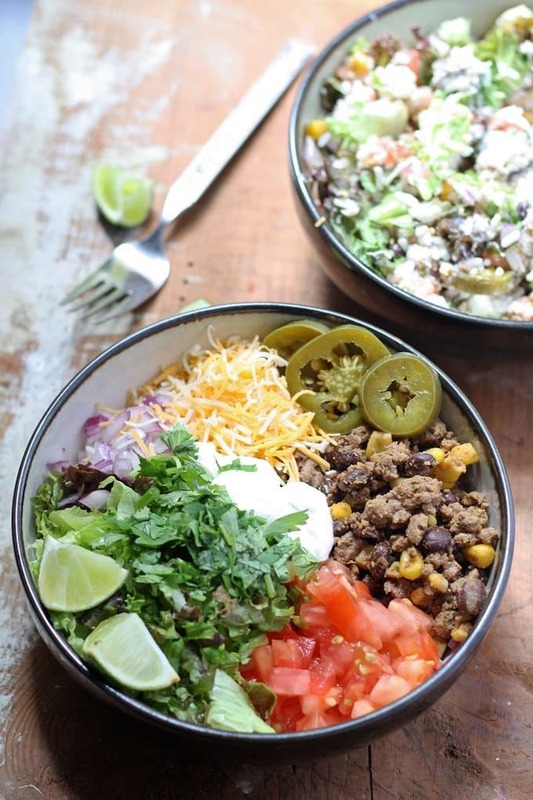 If you’re looking for another tex-mex inspired meal, try my Loaded Burrito Bowl recipe! I totally pinned this! It looks amazing!! 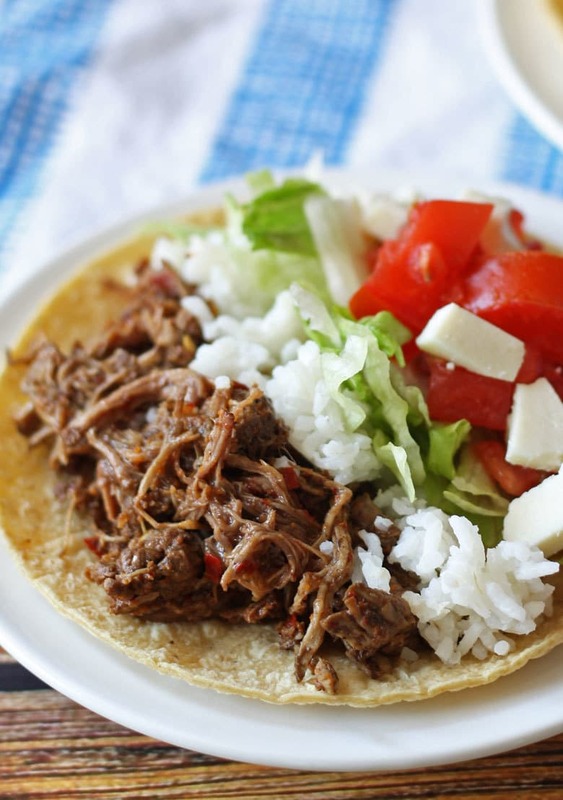 I was planning to cook mexican tonight – so this delicious slow cooked beef is just perfect for me. I’m glad I have all the ingredients on hand so I can start the recipe now! I am totally making this over the weekend. Tacos are my “go to” meal and I can’t wait to try this! Thanks, Jenny B! This looks fabulous, Jenny! I’ll be making it soon! Oh my goodness this looks delicious. 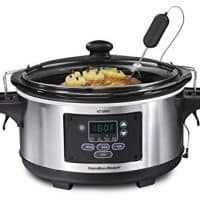 I’m passing the recipe onto my mum because she LOVES cooking beef in her slow cooker and this is a bit different for her. I hope she likes it Laura!! Ah, Christine! Thanks! Here’s to hoping that you don’t have to deal with a gas/electricity outage anytime soon! What a great recipe, I can’t wait to try this one. Hope you are having a great week and thanks so much for sharing your awesome talent with Full Plate Thursday. This looks absolutely amazing, I’m drooling over the pasta bake I’m eating for dinner haha! Tacos are definitely gonna be on the menu in my house asap! Haha, Michelle! I love pasta bakes! Hi Courtney – it is a little spicy. If you are looking for less spice, use one-two less chile peppers. 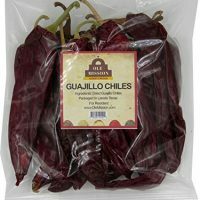 The guajillo peppers are in the medium spice range.